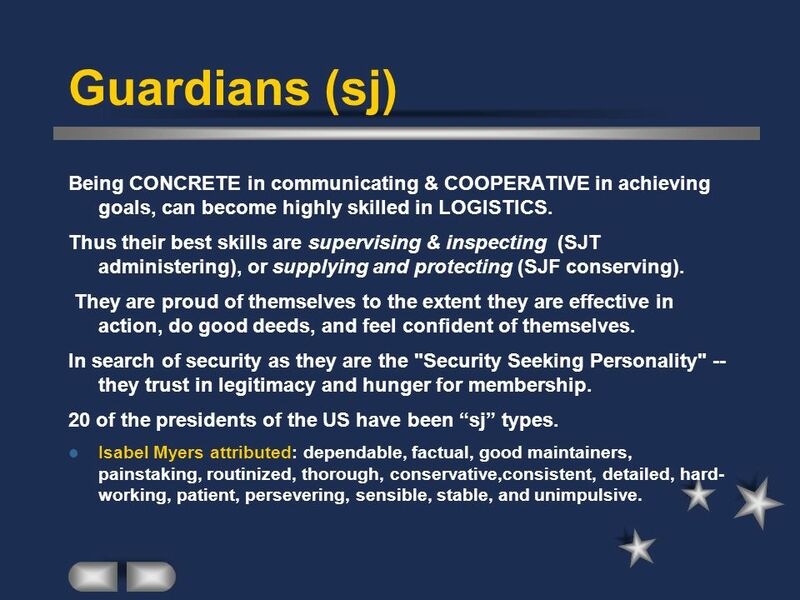 6 Guardians (sj) Being CONCRETE in communicating & COOPERATIVE in achieving goals, can become highly skilled in LOGISTICS. 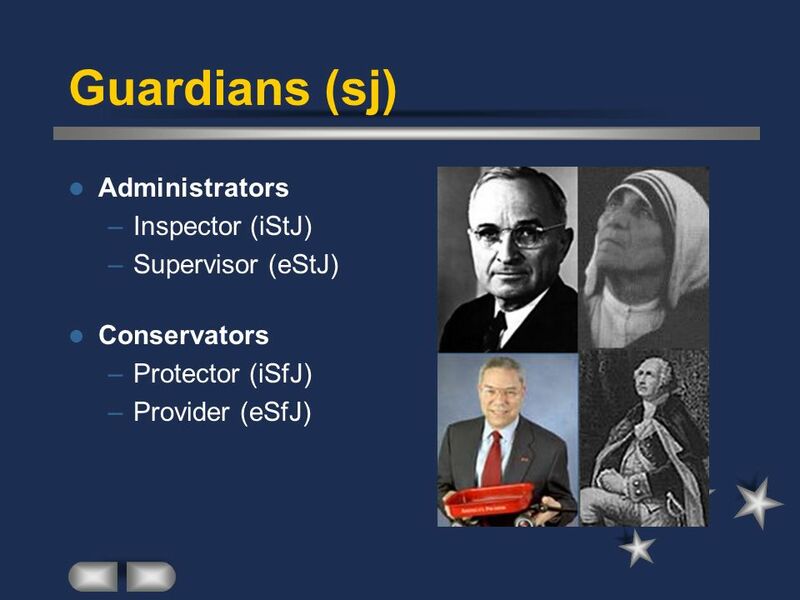 Thus their best skills are supervising & inspecting (SJT administering), or supplying and protecting (SJF conserving). They are proud of themselves to the extent they are effective in action, do good deeds, and feel confident of themselves. In search of security as they are the "Security Seeking Personality" -- they trust in legitimacy and hunger for membership. 20 of the presidents of the US have been “sj” types. Isabel Myers attributed: dependable, factual, good maintainers, painstaking, routinized, thorough, conservative,consistent, detailed, hard-working, patient, persevering, sensible, stable, and unimpulsive. 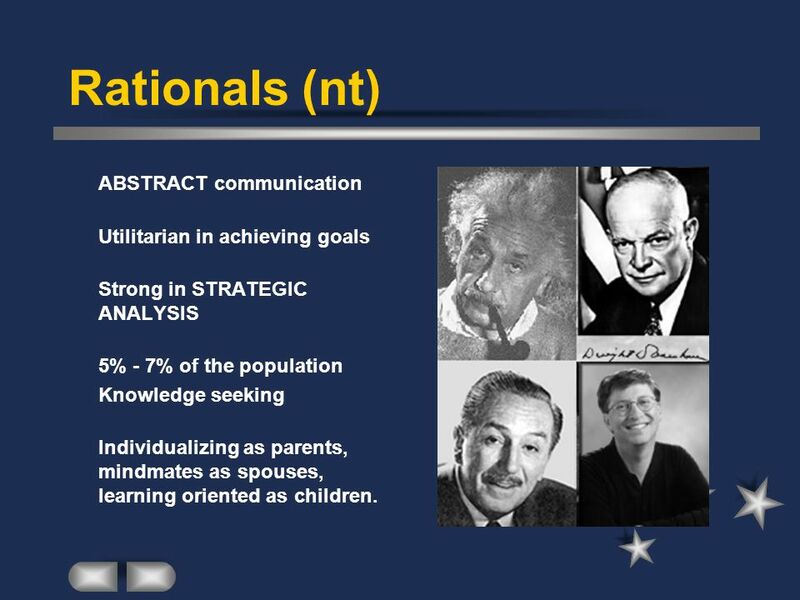 Strong in STRATEGIC ANALYSIS 5% - 7% of the population Knowledge seeking Individualizing as parents, mindmates as spouses, learning oriented as children. 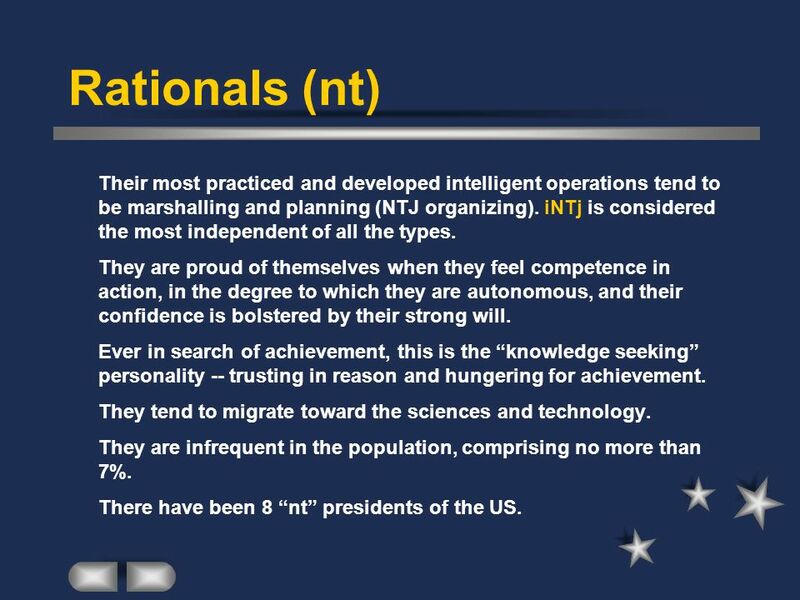 9 Rationals (nt) Their most practiced and developed intelligent operations tend to be marshalling and planning (NTJ organizing). 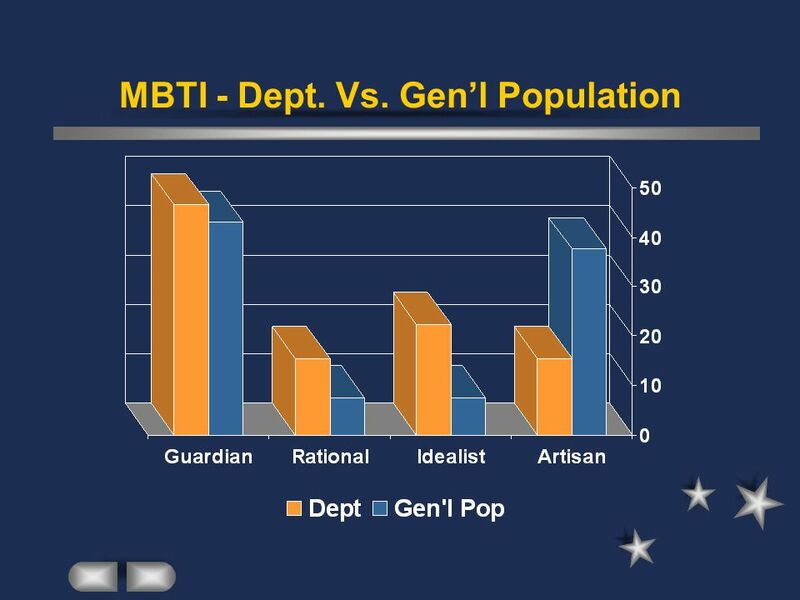 iNTj is considered the most independent of all the types. They are proud of themselves when they feel competence in action, in the degree to which they are autonomous, and their confidence is bolstered by their strong will. Ever in search of achievement, this is the “knowledge seeking” personality -- trusting in reason and hungering for achievement. They tend to migrate toward the sciences and technology. They are infrequent in the population, comprising no more than 7%. There have been 8 “nt” presidents of the US. 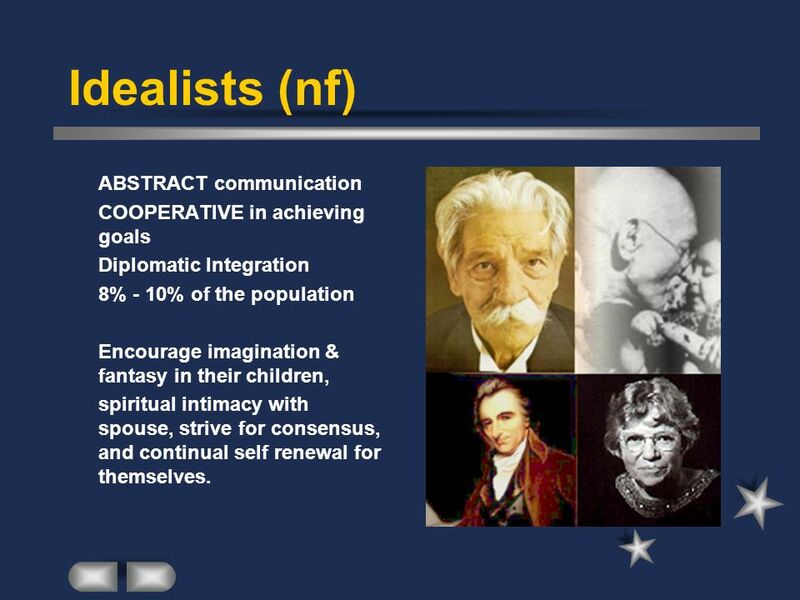 Diplomatic Integration 8% - 10% of the population Encourage imagination & fantasy in their children, spiritual intimacy with spouse, strive for consensus, and continual self renewal for themselves. 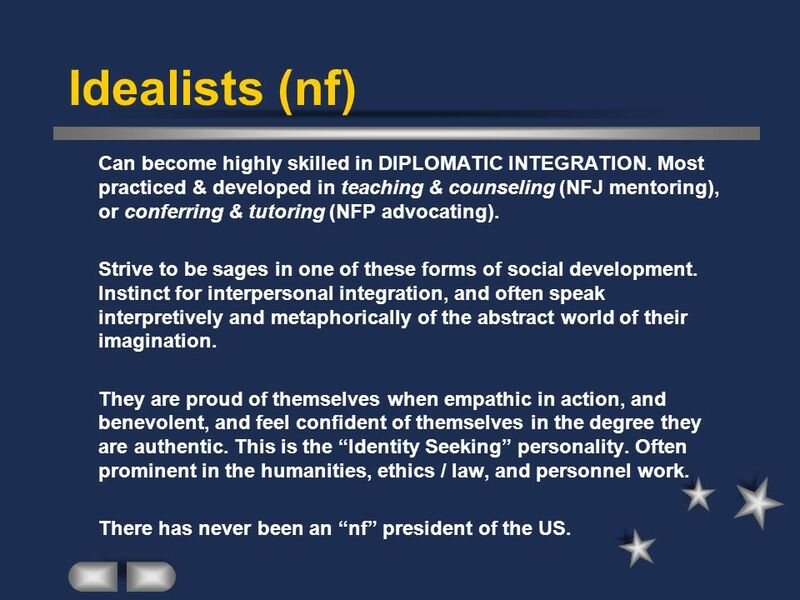 12 Idealists (nf) Can become highly skilled in DIPLOMATIC INTEGRATION. Most practiced & developed in teaching & counseling (NFJ mentoring), or conferring & tutoring (NFP advocating). 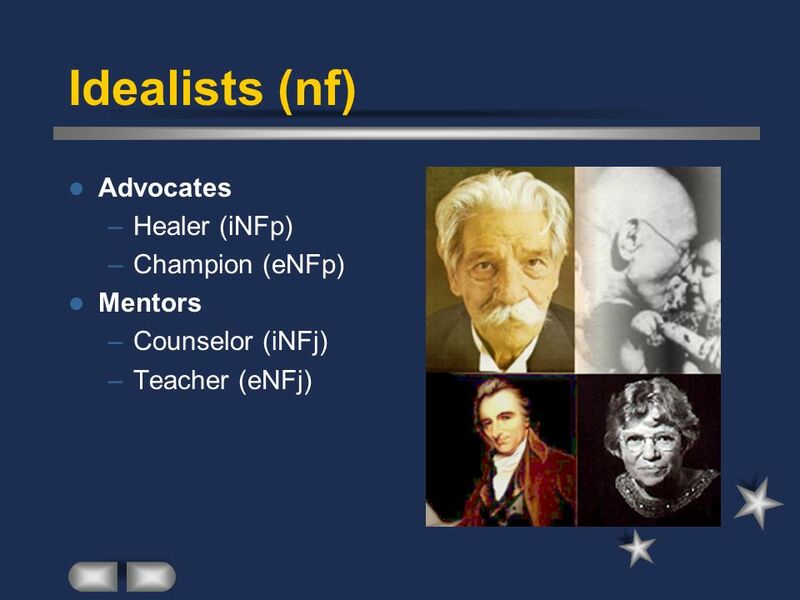 Strive to be sages in one of these forms of social development. Instinct for interpersonal integration, and often speak interpretively and metaphorically of the abstract world of their imagination. They are proud of themselves when empathic in action, and benevolent, and feel confident of themselves in the degree they are authentic. This is the “Identity Seeking” personality. Often prominent in the humanities, ethics / law, and personnel work. There has never been an “nf” president of the US. 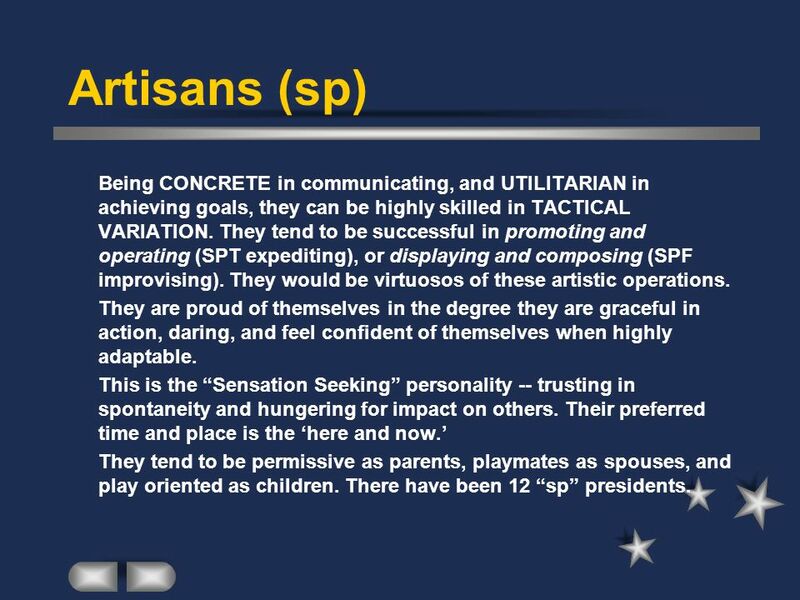 15 Artisans (sp) Being CONCRETE in communicating, and UTILITARIAN in achieving goals, they can be highly skilled in TACTICAL VARIATION. They tend to be successful in promoting and operating (SPT expediting), or displaying and composing (SPF improvising). They would be virtuosos of these artistic operations. They are proud of themselves in the degree they are graceful in action, daring, and feel confident of themselves when highly adaptable. This is the “Sensation Seeking” personality -- trusting in spontaneity and hungering for impact on others. Their preferred time and place is the ‘here and now.’ They tend to be permissive as parents, playmates as spouses, and play oriented as children. There have been 12 “sp” presidents. 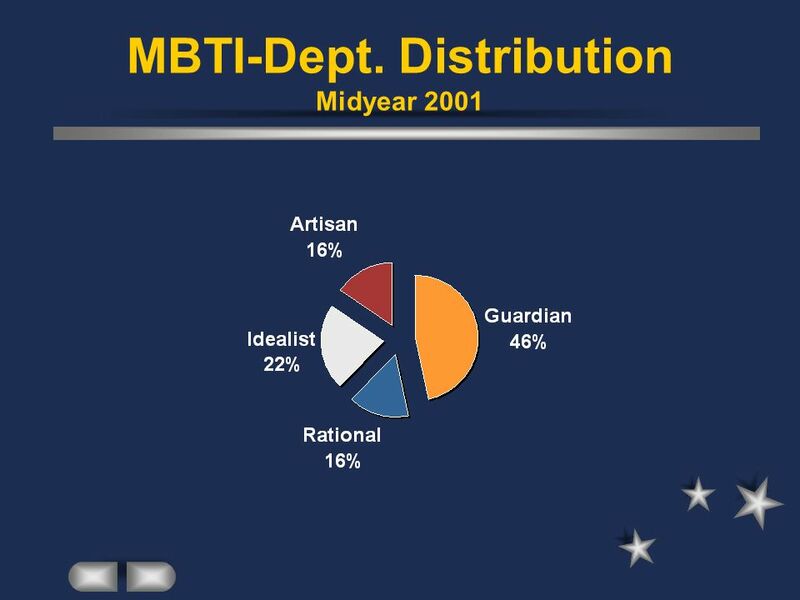 16 Results of the MBTI assessments. 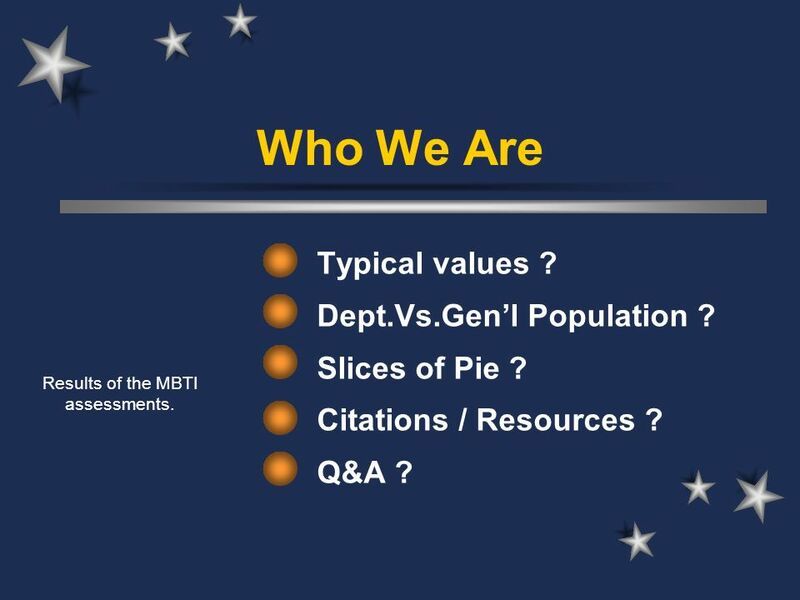 Who We Are Results of the MBTI assessments. Typical values ? Dept.Vs.Gen’l Population ? Slices of Pie ? Citations / Resources ? Q&A ? 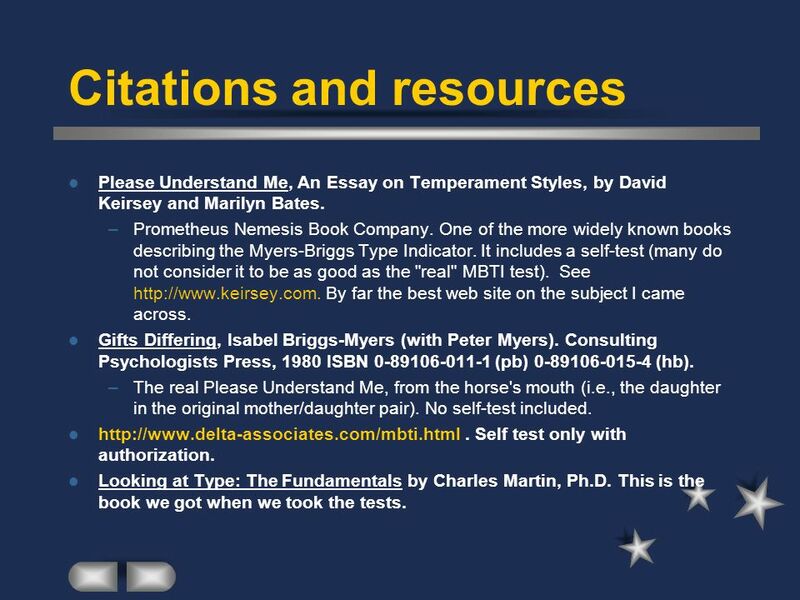 Please Understand Me, An Essay on Temperament Styles, by David Keirsey and Marilyn Bates. Prometheus Nemesis Book Company. One of the more widely known books describing the Myers-Briggs Type Indicator. 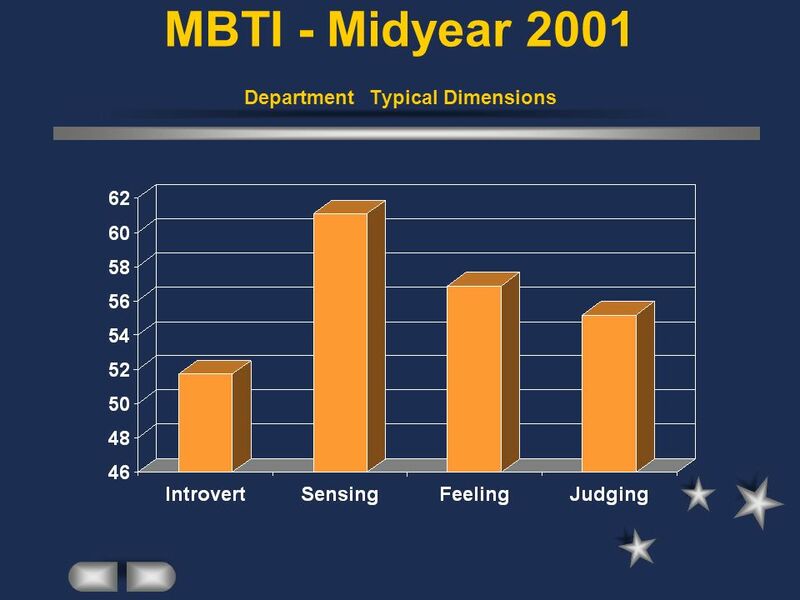 It includes a self-test (many do not consider it to be as good as the "real" MBTI test). See By far the best web site on the subject I came across. Gifts Differing, Isabel Briggs-Myers (with Peter Myers). Consulting Psychologists Press, 1980 ISBN (pb) (hb). The real Please Understand Me, from the horse's mouth (i.e., the daughter in the original mother/daughter pair). No self-test included. . Self test only with authorization. Looking at Type: The Fundamentals by Charles Martin, Ph.D. This is the book we got when we took the tests. 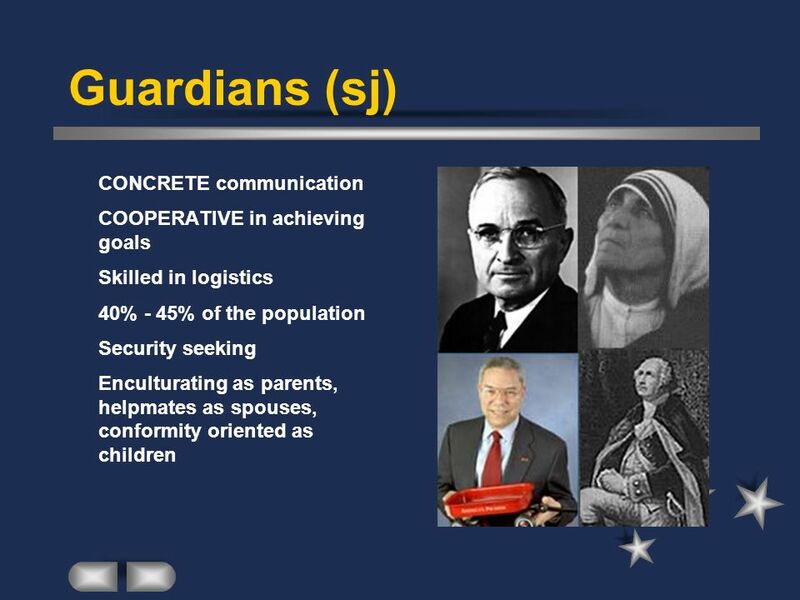 Download ppt "Guardians (sj) Rationals (nt) Idealists (nf) Artisans (sp)"
Lets do The Buzz……. EI I think out loud I generally act quickly Im a good talker I prefer to stand out I think before I speak I.
Kamran Waheed (Fa2012/MSc-EM/CE/ 001) INDIVIDUAL PRESENTATION. Self Awareness Personality and Preference-related Assessments. Building Your Leadership Profile By Carrie Pilant Presented at Imogene Gideon Elementary Monday, November 15, 2010. 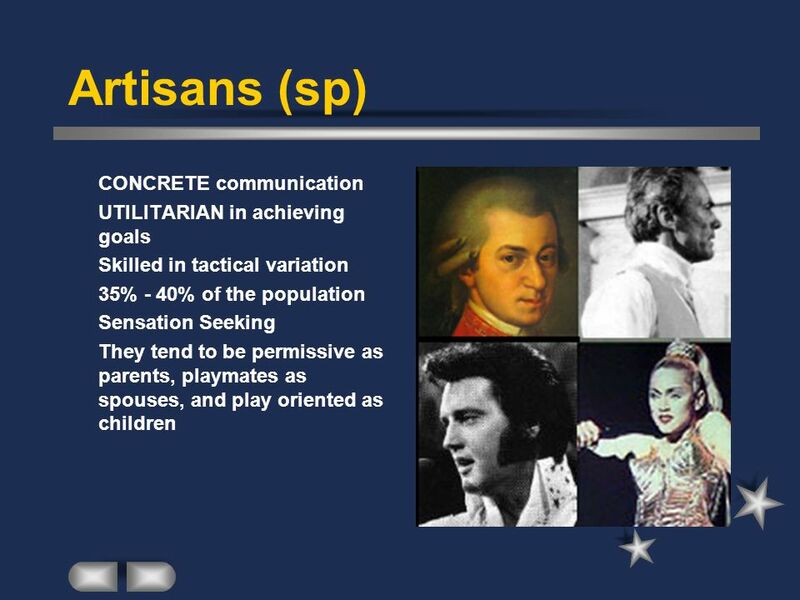 MEYERS & BRIGGS PERSONALITY PROFILE CMUN 10. 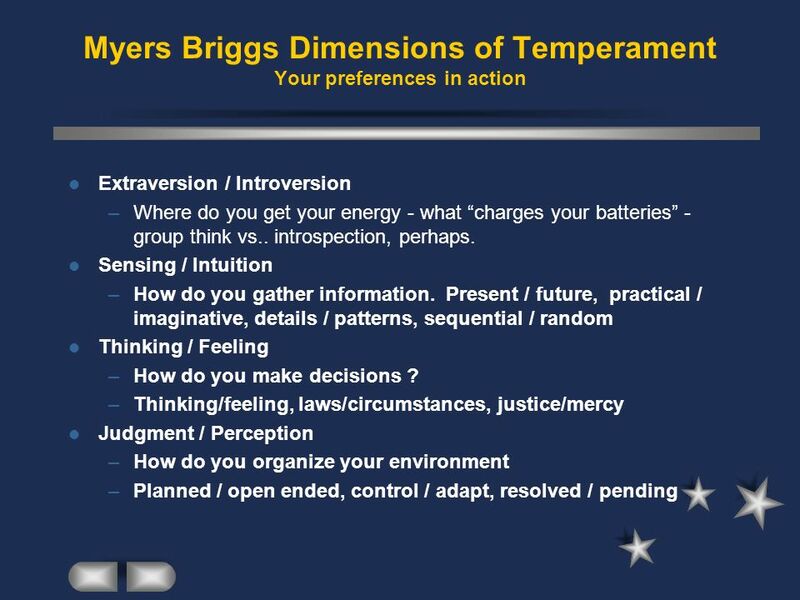 Meyers & Briggs Preference test –Dependent upon context 16 Types –Extraversion/Introversion –Sensing/Intuition. Plan Ahead 11 th Do What You Are #1. Objectives To continue the career planning process by identifying: – Your personality type – Careers that match your. Why Does it Matter? Presumably, different types are better/worse at different tasks – CS needs an unusually broad range of types to get everything done. 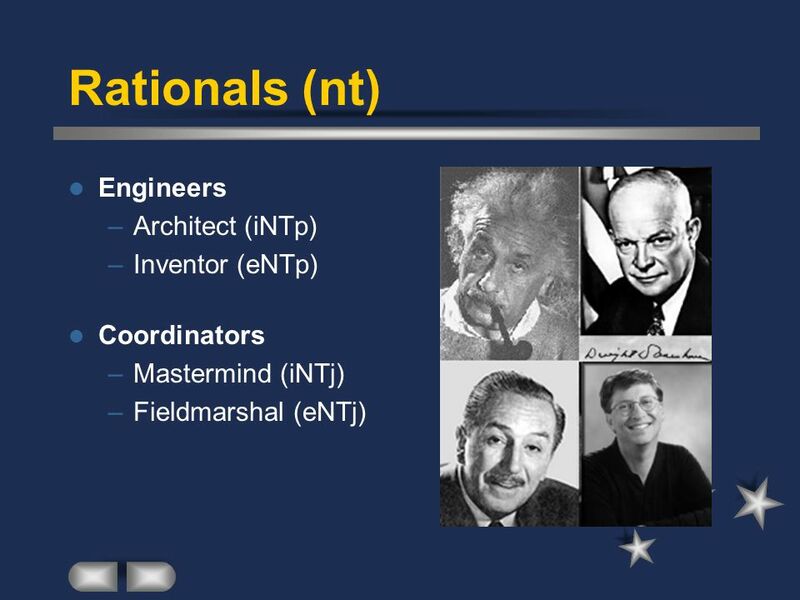 Myers-Briggs Type Indicator Career Applications The MBTI measures Preferences Tendencies Characteristics. Getting to know me…. 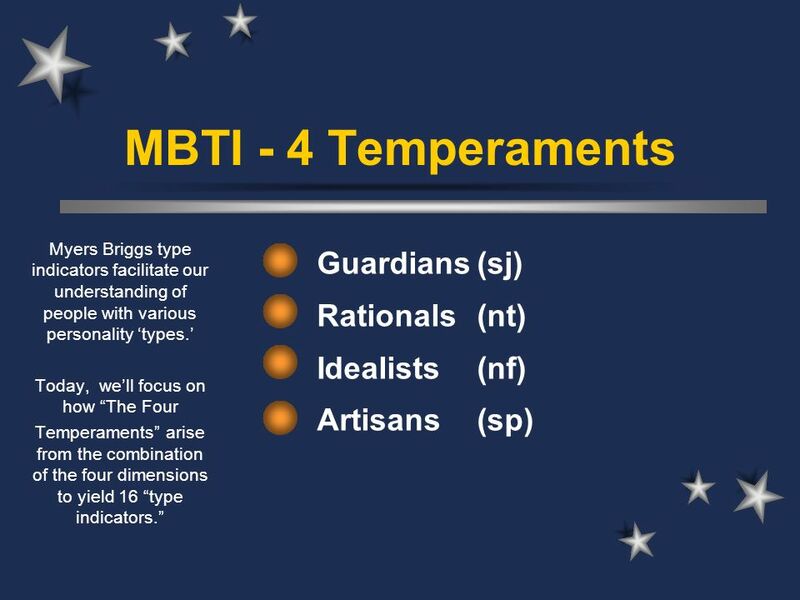 Myers-Briggs Type Indicator. LEARNING STYLES Adapted from Susan Groh, Chemistry & Biochemistry Harry Shipman, Physics & Astronomy University of Delaware, 1999. Drawn from the book by David Keirsey. 2 David Keirsey has provided a very useful framework for analysing personality types. This framework is a good complement. The Influence of Personal Characteristics Personality Culture and Environment. Keirsey Temperament Sorter Personality Assessment. Understanding Personality Differences. 2 Extraversion or Introversion The direction in which we focus our attention and energy.  “Youth is a special time to discern a personal future, a vocation, in which you try to ‘read the eternal thought which God the creator and Father has. Follow Your Dreams A Guide To Planning Your Career – Part I. The Color Quiz Presented by: Mrs. Rex.